After a short stint in the film industry and a long (nearly forty-year) career as a teacher, Robert Kidera finally did what he’d always wanted to do—write fiction. 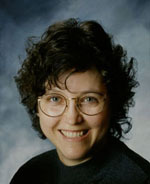 He is an active member of Sisters in Crime, International Thriller Writers, and SouthWest Writers. 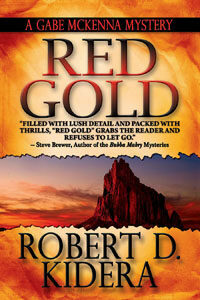 The first installment in the McKenna Mystery series, Red Gold (Suspense Books, 2015), is his debut novel. You can find him on Facebook and his website RobertKideraBooks.com. And check out his SWW Author Page. What is your elevator pitch for Red Gold? I wanted to tell a story that blended history with mystery. I wanted a hero who was strong and smart, but vulnerable as well. It was from those criteria that Red Gold evolved. I like all my characters or they wouldn’t be in the book! Seriously, there is a core of characters upon which the story—and the series that follows—rests: Gabe McKenna, first of all, then C.J., Sam, and Rebecca Turner. My readers can expect to meet them in each of the stories. Will your friends or family recognize any part of you in your main protagonist? What about your antagonist? Of course. Gabe and I spend a lot of time together. As a nod to all my fellow history teachers and professors, I made Gabe one of us. I don’t drink nearly as much as he does, BTW. But we think alike and have some of the same Attitude. As for my antagonist, I sure hope not. He’s a real SOB! Is there a scene in your book you’d like to see play out in a movie? I tend to write visually, cinematically. Perhaps that’s because of my background in films. Every scene in the book is something I have watched unfold in my head. If I had to pick a single one, it would be the showdown scene in the cave at Baldera Volcano. Why did you decide to use New Mexico as the main setting for Red Gold? Two reasons: first, I live here and make it a point to visit every site I use in my books, to get my feet on that ground. The spirit and history of this area is something I feel very strongly. New Mexico is one of my main characters, you could say. Second, is there any better location for a story? New Mexico has history, romance, danger, beauty, people of all types, and absolutely anything can happen here. My father inspired me to write. He was a professor of journalism at Marquette University and one summer wrote a textbook called Fundamentals of Journalism that was widely adopted by colleges coast to coast. It put food on our table! I watched him write that book, and I thought it was pretty cool. So I decided then—as a six year-old—that one day I would become a writer too. My dream was realized on April 21, 2015 when Red Gold debuted. At my current stage, I’m more aware of my weaknesses than my strengths. If I had to choose one thing, I’d say my greatest strength is I know how to tell a story, how to develop it and make it whole. The weakness I have worked hardest on is dialogue. I tended at first to write characters who were too verbose. I took courses on dialogue writing, eavesdropped on a lot of conversations, learned how to self-edit, and read some of the masters of dialogue to improve my style. In my genre, I have two favorites: Raymond Chandler and Donald Westlake. Chandler is quite simply a master. He has style, setting, dialogue and a great protagonist in Philip Marlowe. And he started writing late in his life, as I have. He is my inspiration. Donald Westlake’s books are so much fun to read; I imagine he had a ball writing them. His style is crisp, funny, brilliant. And his characters inhabit a completely whacked-out world. I love his work. What part do beta readers or critique groups play in your writing process? They have played an enormous role in my development. When I started out a few years ago, I really had no idea if what I was writing was any good. I was writing the best I could at the time, but would others find it worth reading? I dedicated Red Gold to all the members of my various critique groups and to SouthWest Writers, without whose support I could not have finished the book. I’m not afraid of constructive criticism, I need it. What part of the writing process do you enjoy most: creating, editing/revising, or research? I absolutely enjoy it all. Writing a novel is a thrilling and all-consuming endeavor. Except for all the pain. If you had an unlimited budget, how would you spend your money for marketing and promotion of your book? Wow. If I had a truly unlimited budget, I’d hire somebody else to do my marketing and promotion. Then I’d take the rest of the money, buy a mountain cabin where I could write undisturbed, do a lot of traveling and research all the locations of my stories. There is one main recurring theme in my first three books: Life is a struggle to find the truth and there is an inevitable loss of innocence along the way. Which point of view do you like writing the most (first person, third, etc.)? For the McKenna mysteries, I chose to write in first-person. It was the best way for me to write my protagonist from the inside out and to really inhabit the scenes of the story. My fourth book will be written in the third person. It’s historical fiction. How has your experience as a teacher affected your writing life? Do you ever get hung up on the rules? I saw myself as a story-teller all the years I taught history. I presented a Grand Narrative, whether it was American History or Western Civilization. All the elements were there: great ideas, great characters, drama, triumph and tragedy. As a teacher, I never got hung up on the rules, which is why I got along better with my students than with administrators. People who write are called writers. People who wait are called waiters. I’d advise you write every day, if only for the sheer pleasure of it. Don’t worry about the Great American Novel, etc. Enjoy what you do! Or find something else to do, life is too short. Get Lost, the second McKenna Mystery is coming out on March 8, 2016 from Suspense Books. I am working on the third novel, Cut.Print.Kill. and hope to have that out early in 2017, God-willing. My fourth book will be historical fiction, an elaboration on and extrapolation of several short stories from Black Range Tales, a fabulous depiction of 19th Century New Mexican mining days, written in 1936 by James A. McKenna. I’d like my readers to know how grateful I am for their faith in what I write. I will try to continue to spin some tales they will find uplifting, enjoyable and worth their valuable time. Thank you, one and all. Thank you, Mary, for responding to my interview. New Mexico really is a unique and wondrous place, isn’t it? I hope you enjoy RED GOLD and will consider my second novel GET LOST when it comes out next March. Thank you again!